The strawberry seed, as with all seeds, contains the genetic material necessary for the continuation of the plant species (see the Strawberry Seeds page for more details). Upon sprouting, the roots are sent downward into the soil, and the transformation of nutrients into plant matter proceeds as the life cycle of the plant is perpetuated by resources obtained from the plants surroundings. These seedlings are genetically varied from the parent plants. Alternatively, established strawberry plants multiply themselves by means of clone or daughter plants extended from themselves by means of stolons to root some distance away from the mother plant and be established as an independent, but genetically identical, strawberry plant (see this page for more details: Strawberry Runners). 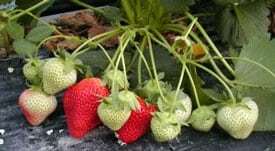 Strawberry seeds will usually sprout in the late winter or spring after a period of cold stratification during winter months (but this isn’t required for all strawberry varieties) while runner plants are generally established later in the spring through the fall during warmer temperatures. Once root growth commences, plant growth begins in earnest for both seedlings and runner plants. This allows all parts of the strawberry plant to grow and mature. The runner plants have a distinct advantage over seedlings. They start out larger and have a more fully formed support system providing the energy needed for development. But, by the time late summer and early fall rolls around, both seedlings and runner plants are usually established. In the process of growing, the plants will have sent forth roots and produced a canopy of photosynthesizing tri-lobed leaflets sitting atop non-woody stems. Both roots and leaves extend from the hub of the strawberry plant, the crown. Once the plants have matured, they are ready to multiply and expand. The do this by means of the runner plants that have already been mentioned. The runners (stolons) are usually between 8 and 18 inches long, depending on the strawberry variety. These extensions serve to spread a strawberry plant’s range and find areas more favorable to growth, whether through higher soil quality or increased exposure to sunlight. Most strawberry varieties are adept at multiplication in this fashion, and they are even considered an invasive weed in some situations. While strawberry plants produce runners, they don’t put all their reproductive eggs in the same basket. Each strawberry plant devotes significant energy to genetic diversification through seed production. Strawberry seeds come from strawberry flowers which come from strawberry buds which are formed in the crowns of established strawberry plants. There are some variances of flower bud, flower, and strawberry production depending on which type of strawberry plant is considered (see the Strawberry Variety page for more details). The most common of these types is the June-bearing strawberry, and it will be considered here. During the late summer and early fall, strawberry plants begin forming flower buds within their crowns. During this period, adequate water, light, and nutrients are critical. The flower buds form prior to winter and then move into dormancy (along with the rest of the plant) as the temperature drops. When temperatures again warm in late winter or early spring, the plants revive and immediately begin the transformation of the flower buds into flowers sitting atop stalks. These flowers, like most flowers, are then pollinated by insects and other pollinators. The result of pollination is a large mass of (usually red) accessory tissue studded with individual seed-containing fruits (there are also white strawberries, however). These achenes are attractive to birds and other creatures (including humans!) and are eaten. They are then digested. The remains, including many viable seeds, are then deposited in different locations to sprout and begin again the life cycle of strawberry plants. The life arc of strawberries begins with the establishment of a new plant, peaks two to three years later, and then proceeds toward senescence and death two to three years following its peak. Under ideal conditions, a strawberry plant can live up to 5-6 years. After 3 productive years, however, they usually begin to loss of vigor, and the production of strawberries begins to decline rapidly. Eventually, as age progresses and the strawberry plant weakens, strawberries usually succumb to ubiquitous opportunistic fungi or other environmental pathogens. The death process usually commences with spots, defects, and browning of previously healthy plant tissues and ends with a brown, withered, decomposing mass. Throughout their life, strawberry plants provide many times their own weight in harvested strawberries. They are one of the most productive plants when what is produced from the weight of the plant is considered. Strawberries begin to ripen four to five weeks after the first flowers open and continue to ripen for about three weeks. Have you considered growing strawberries yourself this year? If so, there are a host of suppliers from which you can find multiple strawberry varieties for sale. 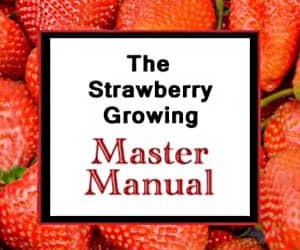 Simply see this directory: Strawberry Plants for Sale. Understanding the growth cycle of strawberry plants can help you in your strawberry growing endeavors. Good luck! I’m a Southern California container gardener, and back in September I rooted runners in a pot that established very nicely. We are now at the beginning of February and the plants are producing bunches of strawberries anywhere from 5-7. While I’m happy to see this, I’m also concerned about the time of the year, and with it being “cold for California” at this time, how will it affect the flavor and size potentially growing in an “off-season”? Should I pinch the blooms off to allow them to mature more, and start fertilizing them in a few weeks with Spring coming? Also, is it typical for newly established runner plants to begin producing so many berries? Do we require a mother plant to produce runners. (OR) any strawberry plant can produce runners. I have been growing ever-bearing strawberries in pots and every winter, I put them in the ground. In the spring I dig them up, cut the plants into two to three separate plants and put them back into pots. It has worked well and they have produced large strawberries. Since I have been purchasing new soil every year(mine is sand), I had a bed put in this year to create a permanent home for them. I have 18 plants now and the original is about 4 years old now. They look healthy and are still producing a lot of strawberries and taste great, but they are tiny. Is this what happens when a plant gets too old or could they be unhappy with the new soil? I did transplant them a little later than usual as I waited for the bed to be completed. I also have ever-bearing berries that I finally planted into a bed. I find, the only thing that determines size seems to be how much water they get. So I’d give it time, and let them keep rooting before you expect too much from them. But wow, get excited! I am planting 2500 surecrop strawberries here in Virginia this year, Southwest Virginia. Surecrop are June producers and I got them so they would produce a couple years. So what type of mulch would be best. I wanted the plastic mulch but will the strawberry be able to produce through the plastic? My question is….my plants produced an adunfance of strawberries for about 4-6 weeks. The plants seem to be slowing down and some of the leaves dying. Is there anything I should do or can do to get the plants to keep producing or is the berry season over. We live in Montana and it’s been very hot and Sunny!! Thank you! It sounds like your plants are likely June-bearing strawberries. If so, exactly what you described is completely normal! For June-bearers, the season is likely over. You may get onesies and twosies for the rest of the year, but they won’t produce a heavy crop again until next spring. Good luck! What time of year are plants dug for commercial sale? The nurseries that produce plants for resale have several different methods of growing plants for resale. Many will utilize clonal propagation from tissue culture (like Nourse Farm) or crown separation. Runner propagation is also utilized to make plug plant trays that are then sold. The growing mainly occurs during the summer and fall with dormancy occurring prior to shipment. Since dormancy is variable by region and can be artificially induced, commercial sales are only limited by the amount of stock and the storage facilities on hand. Hope that helps! I have a big field bindweed problem in my large strawberry patch. I have renovated it several times but have been unable to eliminate the bindweed. I live in Weiser, Id and would like to mow my plants when they go dormant this fall, harvest plants and use roundup to exterminate the patch. What do I have to do to maintain my harvested plants until Spring. or should they be replanted before winter? It is better to transplant them in the fall prior to dormancy. Late September is a great time to transplant. If you want to move your plants to a new location, this might help. Good luck! My question is, does a strawberry continue to grow after it ripens/red. First time grower (albion variety,) have several berries growing now, but I don’t know if I should pick them? They are bright red already, but still pretty small (size of quarter). Help please. No, the berries don’t continue to grow once they are red and ripe. Go ahead and pick and enjoy them! Good luck! Here’s something that may be a bit of a unique situation. I live in an area of temperature extremes. During the summer months, temperatures warmer than 25 degrees Celsius are fairly common, and our winters can be extremely cold(I saw the mercury fall below -30 degrees Celsius repeatedly this past year). I’m looking at an experimental hydroponic setup. Being above ground, without soil around to insulate them, and no reasonable way to run water outdoors during the winter, I imagine plants will die off at a fairly quick rate. So I’m wondering about putting them on racks in the garage with some grow lights. Should the temperature be kept lower and the photoperiod shorter to trigger some kind of an off-season rest cycle for the plants, or will they continue to produce normally if maintained in more “summery” conditions? If you grow them in a climate-controlled environment, they will produce regularly. To induce dormancy, the best way to do it is to drop the temperature below freezing and shorten the photoperiod. However, if growing hydroponically and indoors, they will continue to produce if they are a day-neutral variety. Good luck! Hi! Thank you for this informative site. I have a question. I am currently growing some strawberries from seeds here in sunny tropical Singapore. So Im planting them in an air-conditioned office under blue/red LED grow-lights. Im sowing an ever-bearing variety known as Fragaria ananasa. They are germinating very well! My question is, since we know that strawberries need to enter the various cycle eg: growth and dormancy, it will be hard to replicate this. Will it still be possible for an ever-bearing variety to be in continuous state of bearing fruits without having to go through the cycles? Is there a way to induce the plants to reach dormancy? Congratulations on your early success! Strawberries do not have to enter dormancy, it is just a natural part of their life cycles since they are temperate plants by nature. They can be grown continuously under grow lights. As long as the climate is acceptably controlled, they will continue to produce for you until the plants burn out or lose their vigor. You can induce the plants to enter dormancy by reducing light and temperatures, but I wouldn’t recommend it in your case. I would just let them produce as much as they will and replace them when their production starts to decline noticeably. Good luck! I’d recommend that you start here. Good luck! How KM/H the speed of growth of strawberry plant ?. I’ve never been asked how fast in km/h a strawberry plant grows! An average modern strawberry plant can be expected to reach towering heights of about 12 inches at its highest point. It usually takes an established strawberry plant about 2 months from the break of dormancy to get there. A new seedling will typically take around 6 months to reach that milestone after germination. So, let’s do a little math. Established plants grow at a rate of 12 in/2 months. Seedlings grow at a rate of 12 inches/6 months. There are about 39,370 inches in a kilometer. There are 730 hours in a month. So, [(12 inches/2 months) x (1 month/730 hours) x (1 kilometer/39,370 inches) / 12] = 0.0000002 km/h. That’s slooooooow. A seedling will take 3 times longer to reach its full height. Of course, growth rates are contingent on a host of factors (plant nutrition, weather, climate, location, etc.). So, your plants may move a bit faster or slower. Regardless, good luck! 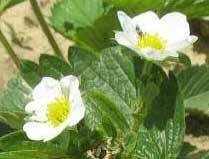 The petals will naturally fall off the strawberry flowers as it transitions into the strawberry. If your plant’s leaves are green and growing, don’t worry about the petals falling off. It will be fine! Good luck! how long from seed germinated until it will have some fruit? Is those F1 strawberry seed will have big fruit? What advantage of using F1 seed, is the fruit result will be same between different plant grow from each individual F1 seed? Usually between 12 and 24 months, depending on when you germinated the seed. F1 hybrid seeds are advantageous as certain hybrids will grow true from seed. So, with the F1 hybrids, you know what you are going to get, genetically speaking. With random seeds taken from strawberries purchased at the store or grown from the hybrid cultivars in most gardens, there is no telling what you will get. Sometimes you get sterile seeds (no plants), sometimes you get plants that don’t resemble the parent plants much at all, and sometimes you get nice strawberries. There is just no way to tell prior to germination. With the F1 seeds that are sold, the fruit result will be roughly the same from plant to plant. Good luck! I have a question. How long does it normally take to turn a bloom into a strawberry? It varies depending on the weather, sunlight, nutrients in the soil, etc. However, it will often take between 3-4 weeks. Good luck! How long do strawberries last?? Strawberry plants can live for many years, being perennials. However, they lose vigor starting in year 4 (usually). Actual strawberries have a very short shelf life once picked and will usually mold or rot within 2 weeks or so. Good luck! If you planted them this year, what you have experienced thus far is normal. If the plants are healthy, you should be able to get a harvest toward the end of the summer/early fall. Good luck!